piece and what I liked about it to the photos and links. I hope you enjoy and happy hopping! When I walked into Target this was the first sweater that called out to me. 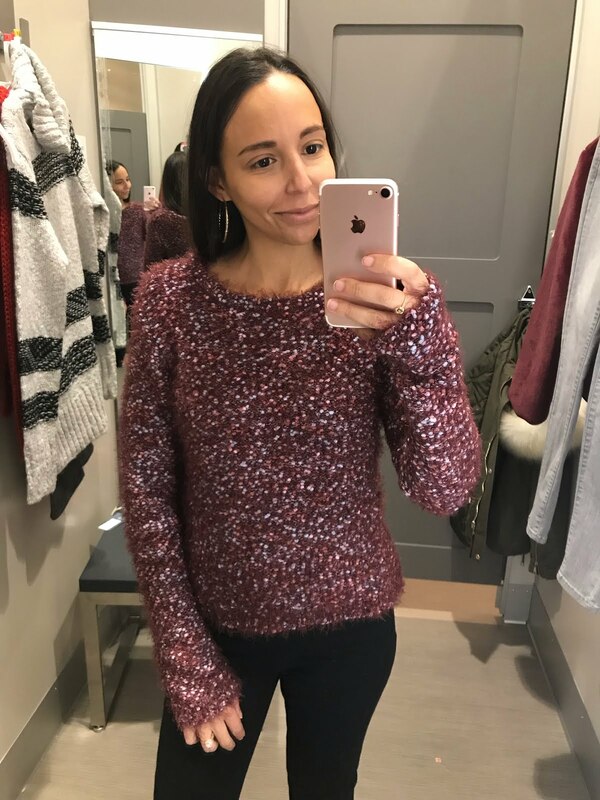 It's comfy and cozy, the sleeves are a little short (perfect for holiday cooking and cleaning) and the tinsel (sparkle) is definitely noticeable. I didn't buy it because obviously it did not photograph well on me but I'll be jealous of the woman that this sweater looks beautiful on. I was surprised to search for this sweater and see that it's description says it's 'metallic'. I might be blind, but I just didn't see it in the sweater. I did love the sweater and it's sweet details. 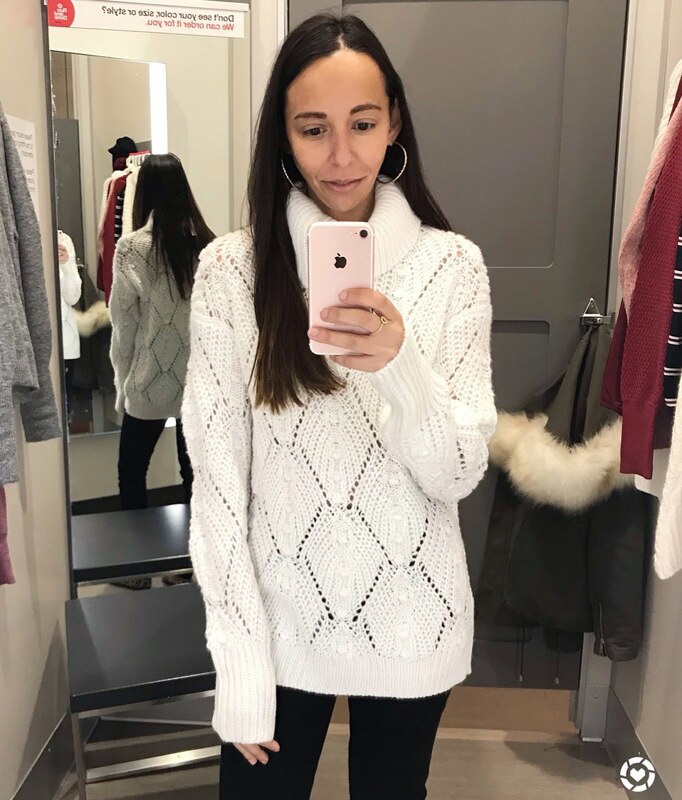 I didn't buy it because it's cold AF here in Pennsylvania and I need sweaters that don't allow draftiness. The open knit, scallop design of this sweater is for Californians or people who spend their winters in 60 degrees not 20 degrees. I love, love, love this sweater but for some reason my skin does not love chenille. 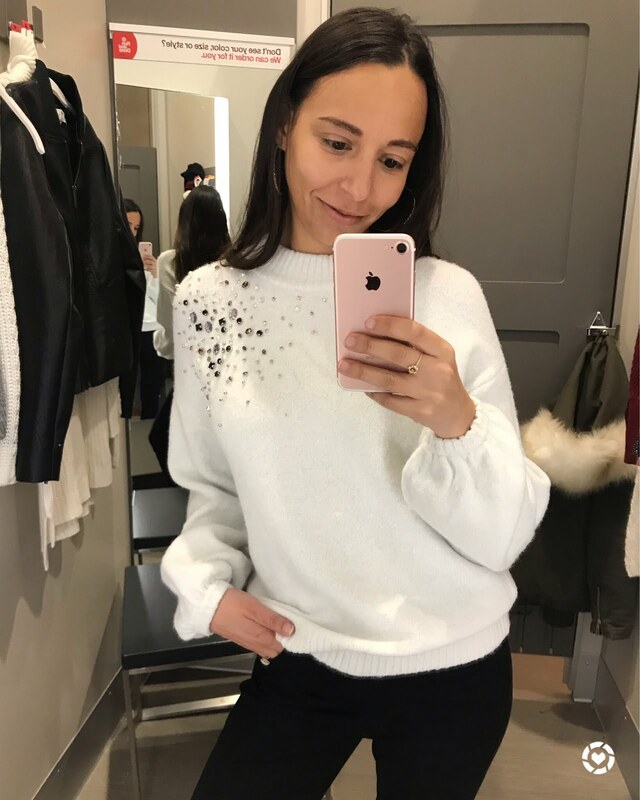 If you love chenille this sweater is a steal and basically a must at that price! This sweater screams my mom. She loves a pretty sweater that hangs a little bit longer. 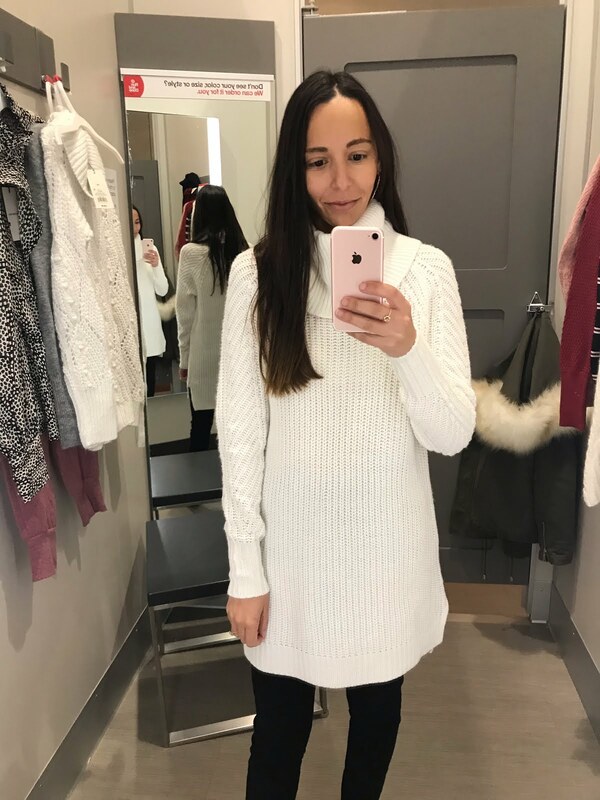 This sweater isn't long enough to wear as a dress but would look great with leggings (in my opinion Spanx Leather Leggings). 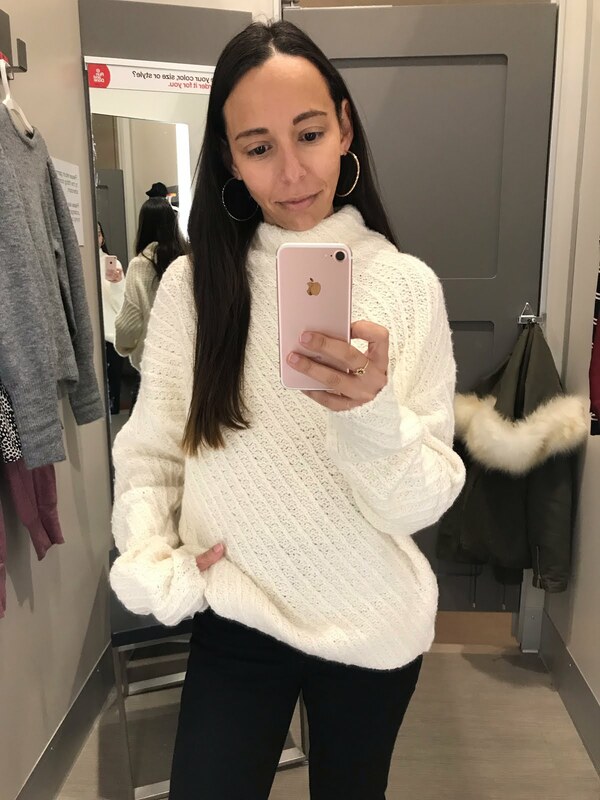 The knit is oh so soft and the turtleneck is loose and comfy. During the holiday season and Valentine's day I get drawn to red. 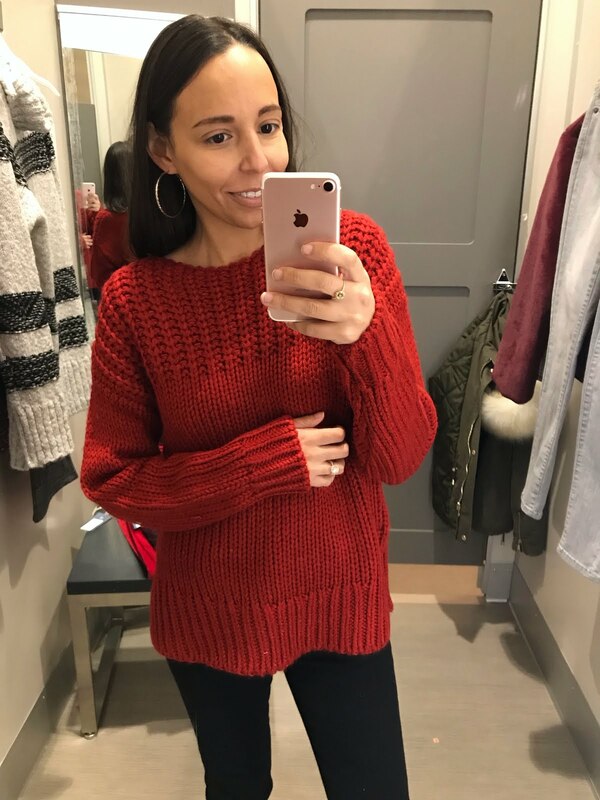 This sweater is red, chunky knit perfection, at a steal! If you told me this sweater only cost $35 I probably would not believe you at first, it's knit looks a lot more expensive. This sweater runs small, which I found funny because usually all Target brand clothing usually runs big on me. 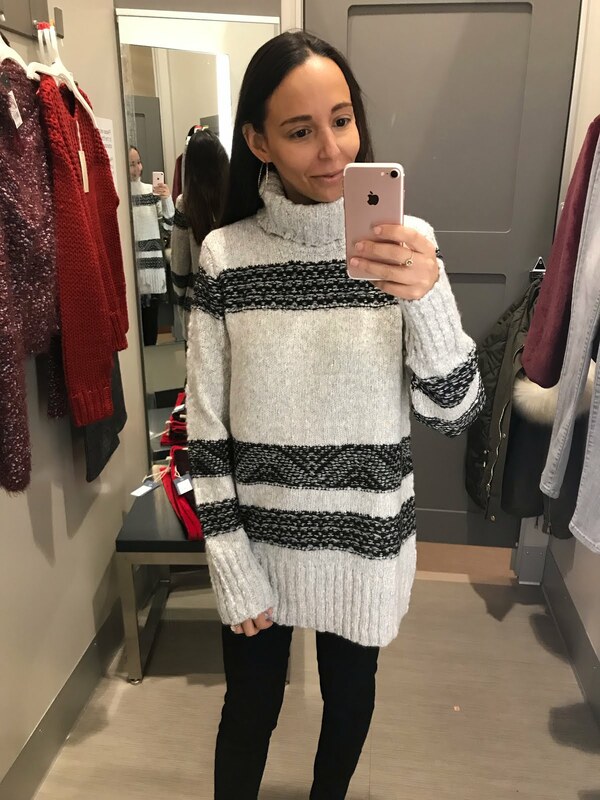 I love this sweater and would size up to a size small for more comfy, cozy vibes. 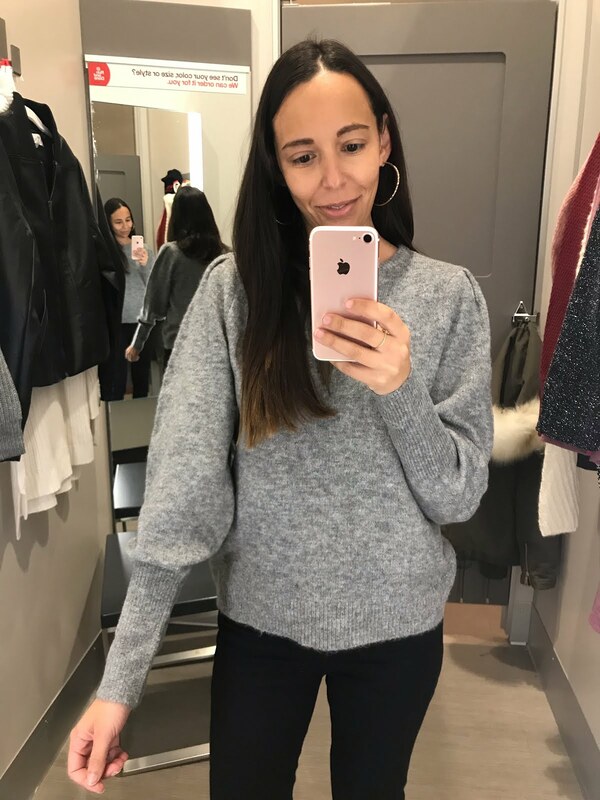 This was my second favorite sweater that I tried on because it's different but not crazy and very soft. This pullover fit me long. If it didn't have slits up the side I could wear it as a sweater dress. I used to wear a lot of sweaters like this but for some reason have transitioned out the look. Don't get me wrong I still like the look of a long, oversized sweater with jeans or leggings but I just don't wear it often. It's another soft and cozy sweater, that would look amazing on anyone. 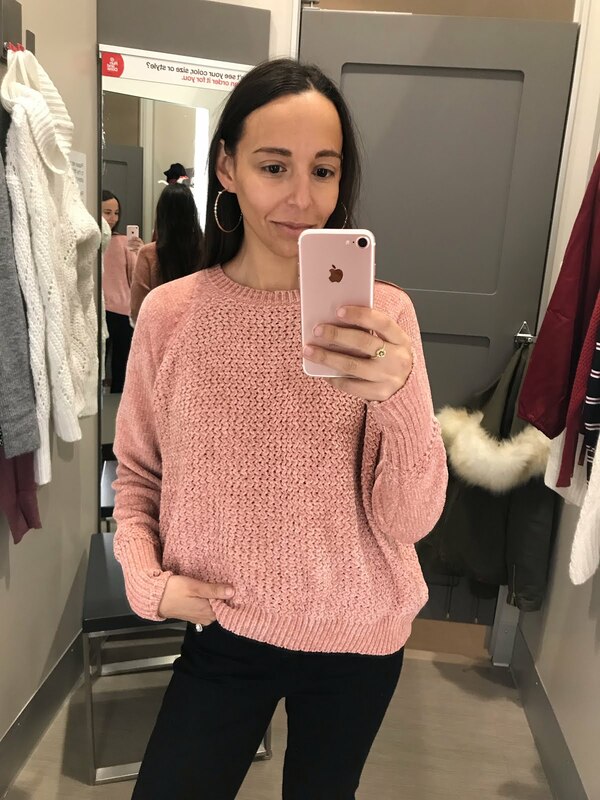 This was my favorite sweater from this try-on session. I know it doesn't look like much but it's incredibly soft and I fell in love with the simple details. The shoulder has a small pleat and the wrist narrows so that the elbow area has a fluffy puff. They didn't have my size in the off-white in store so I ordered it online, hopefully it will be here soon so that I can photograph it for you. 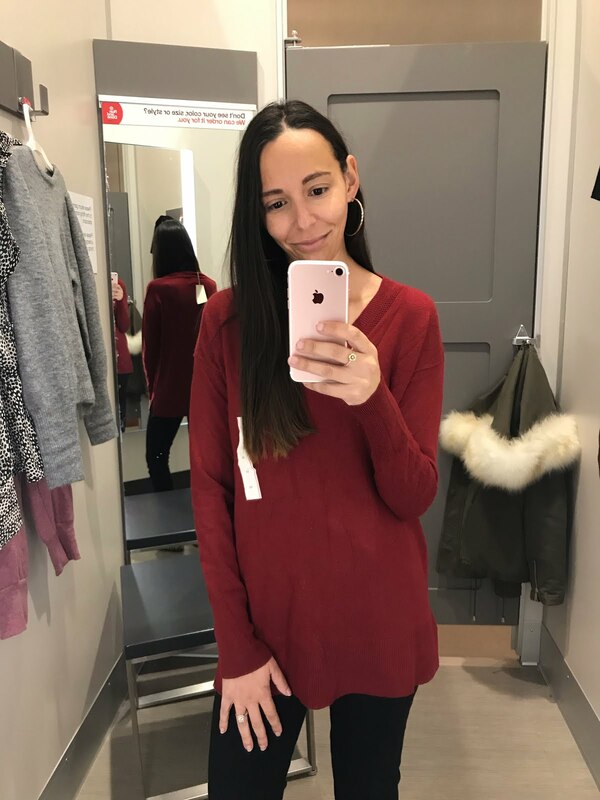 If you are looking for a last minute red (low priced) outfit for a holiday get together, this sweater is it! You can't beat the price and the length in long enough to wear with leggings or to tuck into jeans, skirts or black pants. And the v-neckline is collar bone flattering but not low cut. And if you're not into red this sweater only comes in about 12 other colors. 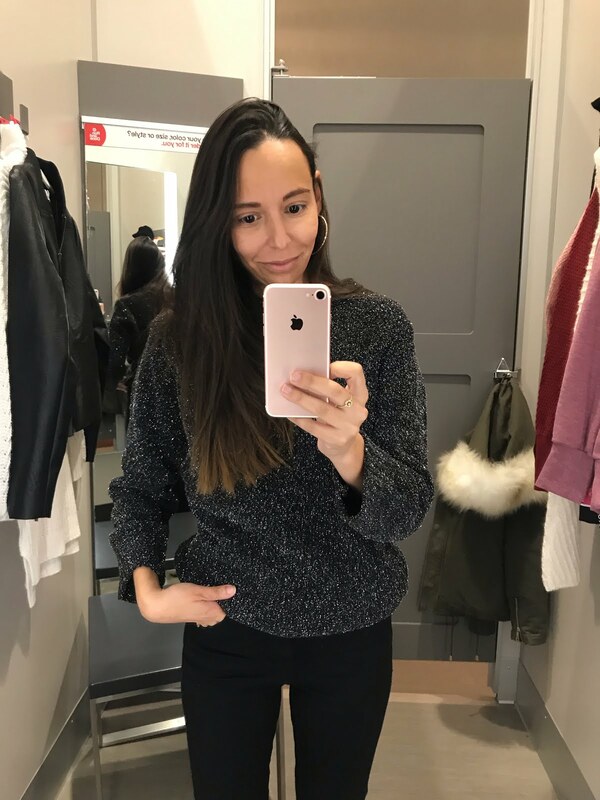 This is the first time I tried on a sweater by Target's brand 'Prologue'. I think it might be a new Target brand. 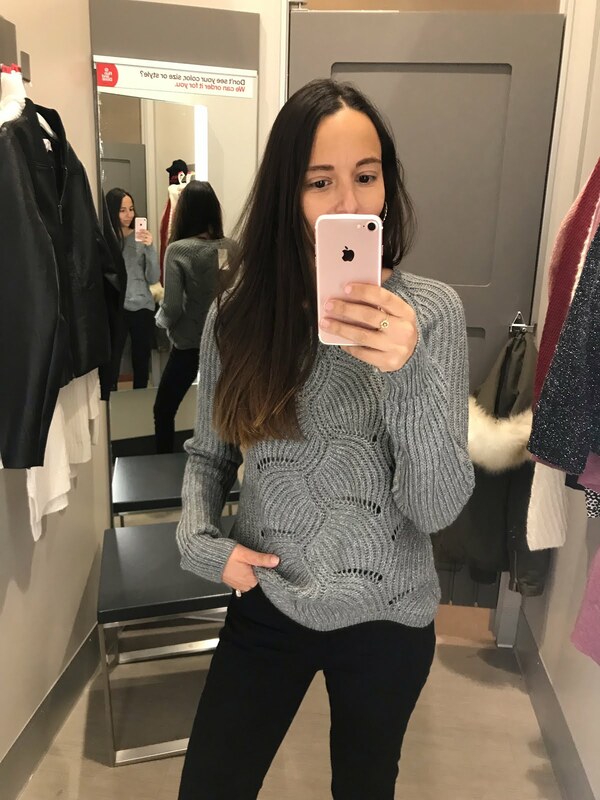 This sweater has the perfect mock turtleneck look and can be worn long or tucked it. Not too long like some of the previous sweaters but it fit me right past the top of my thighs. This tunic looks grey right? No? It's labeled as white/ stripped online. 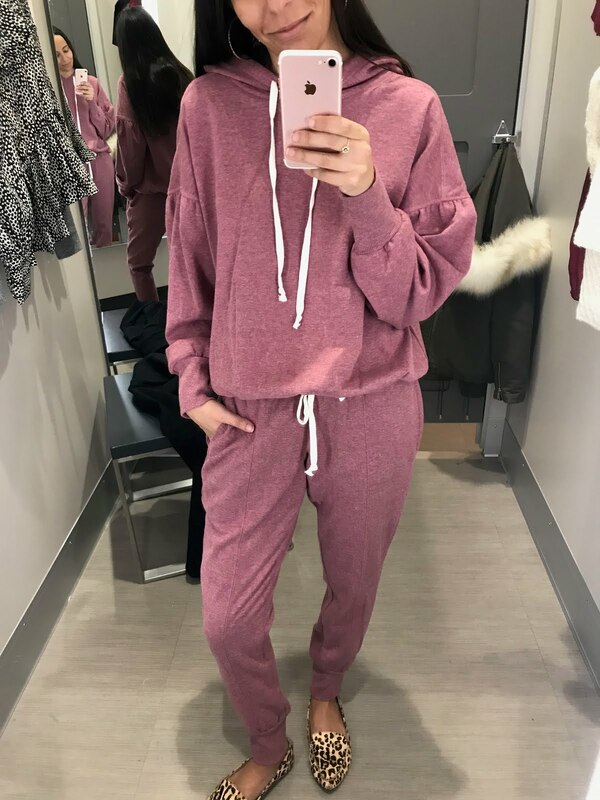 Regardless it's soft and cute, I could see pairing it with a leather jacket and jeans or with leggings because it fits long. The only reason I left this and the next jacket/ coast behind is because K (my husband) will kill me if I buy another coast/ jacket this year. I've bought so many! 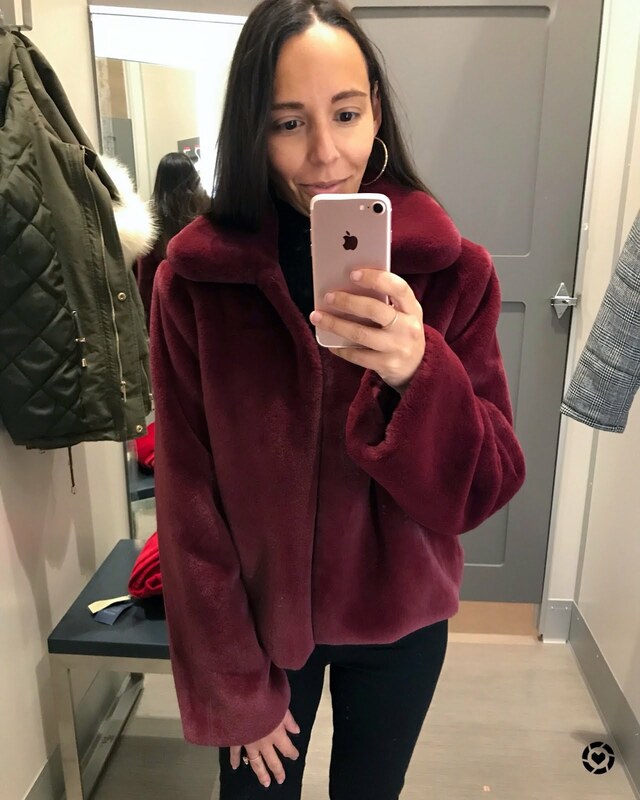 But I fell head over heels for this plush, wine colored, faux fur baby. It would go perfectly over a little black dress for a holiday party or really over any simple outfit. It would make jeans and a white tee shirt outfit look like a million holiday bucks. K is so lucky I have self control. I love it! I'd wear it all the time. It's neutral but different and fun without being overstated. 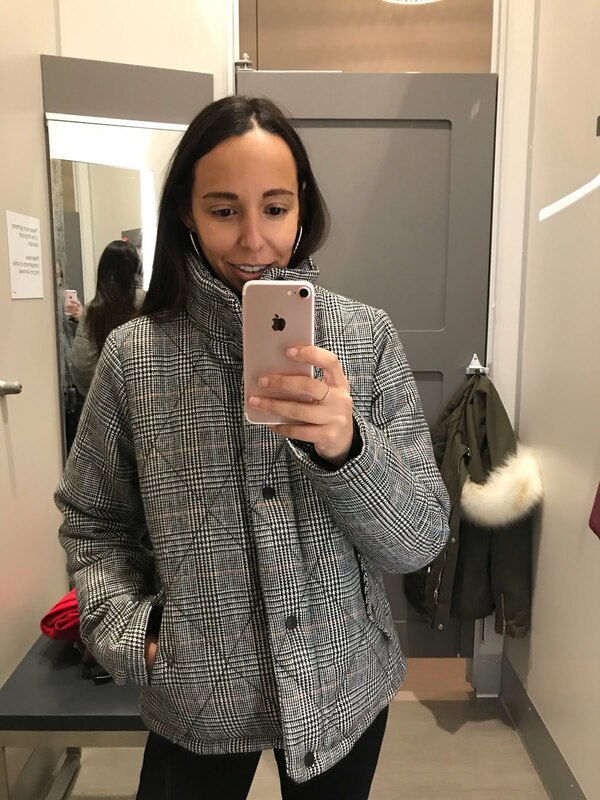 Did I mention I love it and that I'm coat/ jacket obsessed?! 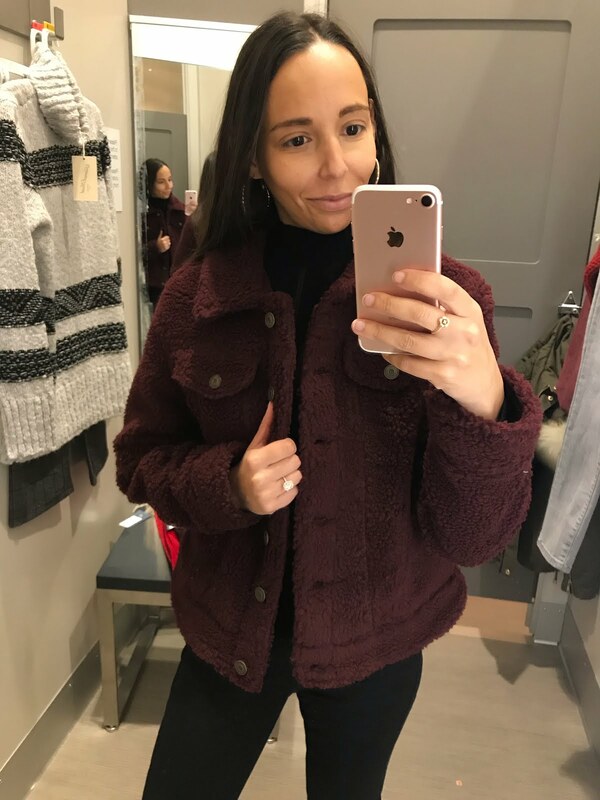 This little jacket was too cute not to try on but would not really work in the climate I live in. The color is gorgeous and the fit looks great. If I lived in Cali I'd wear this all 'winter' long. And a cute little jacket for $35 is a steal. 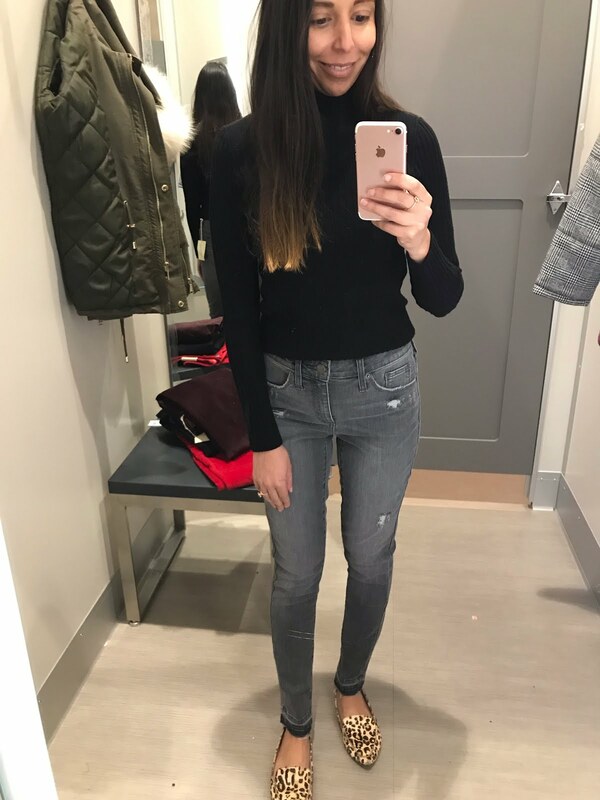 These jeans make my legs look so long! I'm 5 foot maybe 5'1. The slight distressing is very on-trend. The only reason I did not buy them is because they were loose on my waist but I'm thinking for $28 I should just wear a belt. These jeans came home with me. 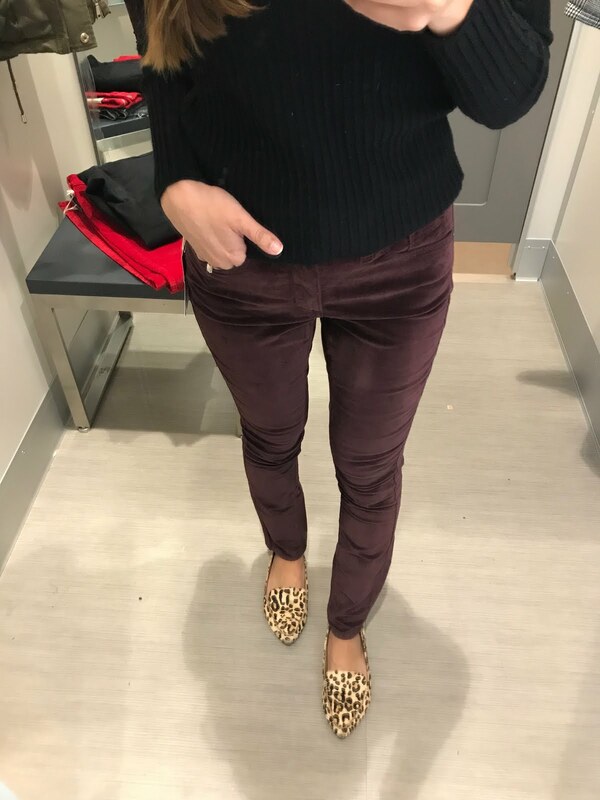 The rise says high but honestly I have much higher rise jeans and I love the wine colored velvet. I'm hoping to pair them with my chunky black turtleneck that K bought me in Paris and sky high black heels for my workplace holiday party. I love this pj set! The sleeve detail is so cute and the bottoms are, oh so comfy. If I were to buy one of these two pieces it would be the bottoms. They would match most grey, black and white pj outfits and are lightweight with pockets! 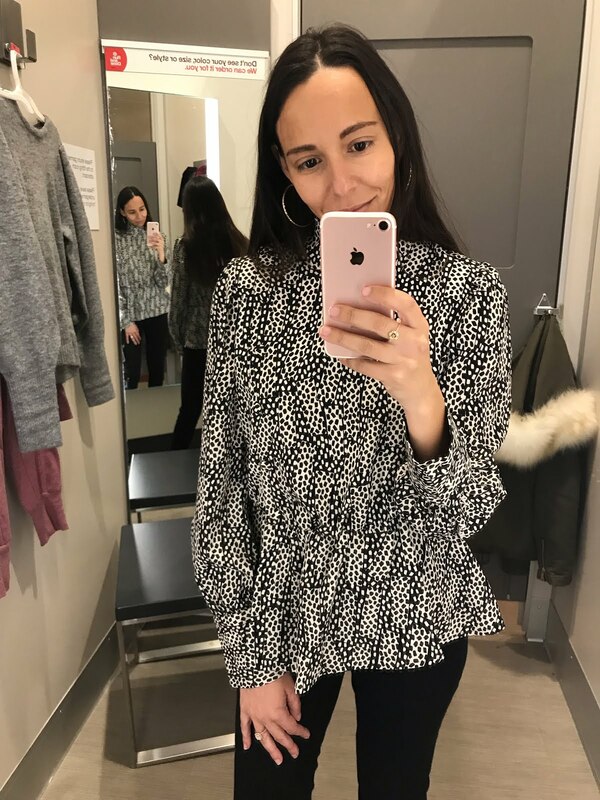 This blouse is not for the light hearted. It's full of style and fun. I was instantly drawn to it because I love polka dots and everything black and white. The asymmetrical details are what really make the blouse. It comes in in two other patterns, both equally beautiful. just stumbled across your blog, and it's delightful! very cute post! Thank you K! I'm so glad you enjoyed the post, more fun posts to come soon!